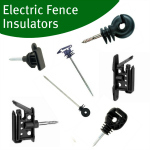 We have many types of electric netting available to suit your needs. From electric poultry netting to sheep nets which is designed to the specific livestock you are looking to contain. 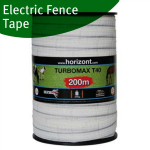 Electric fence netting can provide containment and also protection for your livestock. 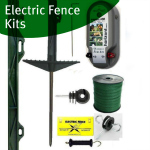 For chickens, ducks, geese and other poultry the protection that electric netting provide can be very important in keeping predators at bay. Each net can differ in length as well as height and mesh size. The standard length for netting is 50m and this usually offer the best value. Heights can range from 90cm for sheep netting to 112cm for poultry netting. Again electric netting can differ further in the mesh size with some nets designed for larger animals such as sheep and other for chicks that have closer mesh near the ground. 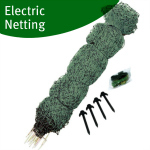 Electric Netting is easy to install and very lightweight. When compared to other methods of temporary fencing, electric netting provides a higher level of protection from predators whilst containing the animal. Electric netting is great for pens for smaller animals also as they are a target for predators such as foxes. One of the features of electric netting is closer meshing nearer the ground meaning smaller animals cannot escape and predators can't get in. Rolls of netting have built in posts allowing easy installation, movement and taking down. It is generally advised that ends or corners of a run of netting are strained using guy rope and extra corner posts. It is recommended to place the energiser in the centre of the fence so the can current flows both ways. 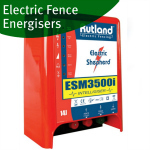 It is not advised that energisers of greater than 4 joules are used with nets as when damp, arcing can occur across the wires, so when choosing an energiser an energiser for netting you have to exclude the more powerful electric fence energisers. When installing electric netting make sure that corners are firm as the flexible posts will bend due to the strain. To keep the net taught, either use the pegs and guy lines provided or anchor corner posts to a fixed wooden post or solid structure using plastic, non conductive wire to prevent leaning inwards or sagging.